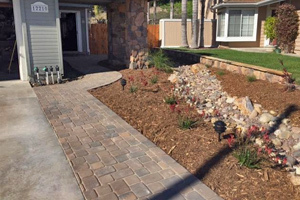 We offer a wide range of landscaping services from weed removal, yard maintenance to Irrigation. We proudly offer swimming pool & outdoor living services, including cleaning, maintenance & more! Check out some of the photos of pools and lands that our team designed, constructed and cleaned! We Value Your Review! If you have some time & appreciated our service, please leave us a review. Desert Services INC. has been a leading provider in high quality personalized pool, spa, and landscaping services since 1992. We are a full-service company providing all aspects of landscaping and pool services under one roof, including design, maintenance, construction, irrigation, stone walls and lighting for residential and commercial clients. Whether you need your pool or spa cleaned, lawn mowed, or you would like your backyard to be the talk of the town, you can count on us to deliver the highest quality work at affordable prices. With the wide range of services offered, we look forward to providing our customers with the excellent service we are known for. We can help meet any budget or beat any price. Contact us today to find out how we can help create the Landscape of your dreams! Desert Services INC. can help create the Landscape of your dreams!